A symbol of unrivalled wisdom and power, China’s dragon is a long, scaly, snake-like creature with the paws of a tiger and the claws of an eagle. This chimera is an emblem of ancient imperial power. Indeed, the dynastic emperors were known as dragons. The revolutions of the twentieth century made a break with the past, and the present regime does not think the dragon is a proper symbol of China. Instead, the country’s rulers prefer to use the giant panda – that loveable, bamboo-eating member of the bear family – as the national emblem. By tradition a rare and noble creature, the panda has been part of diplomacy since 685 CE, when an emperor of the Tang dynasty sent a pair to his counterpart in Japan. As the world sets its eyes on Beijing, where the Olympicswill showcase progress since the death of Mao Zedong two decades ago, this commentary asks a simple question. Is the panda in charge of Chinese energy strategy, or is it the dragon? From the security of its bamboo forest, the gentle panda would stress comparative advantage. The dragon would rely on cunning, speed and power. Until 15 years ago, China exported oil to neighbouring countries. Today, it has an almost insatiable appetite for the stuff. Since the Great Helmsman’s death in 1976, the People’s Republic has become the world’s second largest oil consumer (behind the U.S.) During those years Chinese consumption has quadrupled to about 7.7 million barrels per day while production – about 3.7 million barrels per day – has barely doubled. The International Energy Agency thinks China will burn 16.5 million barrels per day by 2030, after buying 13.1million barrels abroad. Think about it: Saudi Arabia’s total output is now less than 11 million barrels per day. Based on efficiency, conservation and innovation, thrift is sometimes called the fifth form of energy. 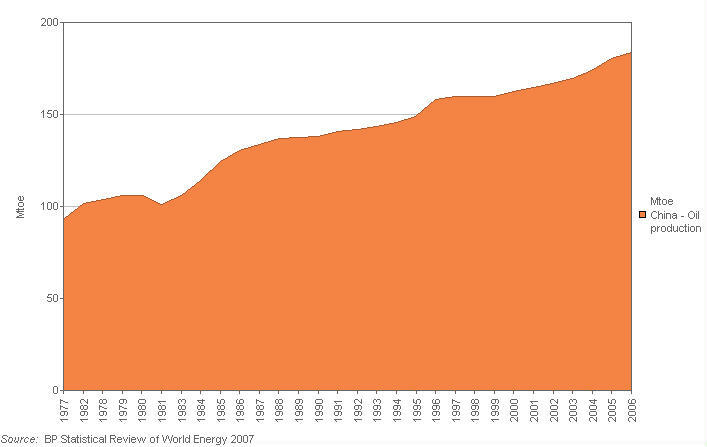 China’s rise is making the world a more energy-efficient place. The country’s energy intensity – the amount of energy it uses per unit of GDP – has dropped by about 75% in the last 20 years, largely because of more efficient industry. Its energy intensity higher than America’s but lower than Canada’s, in 2006 China adopted the slogan “Save energy, cut emissions” as part of a drive to cut energy intensity even further. The country is thus improving its energy efficiency while increasing its energy-intensive role as workshop of the world. 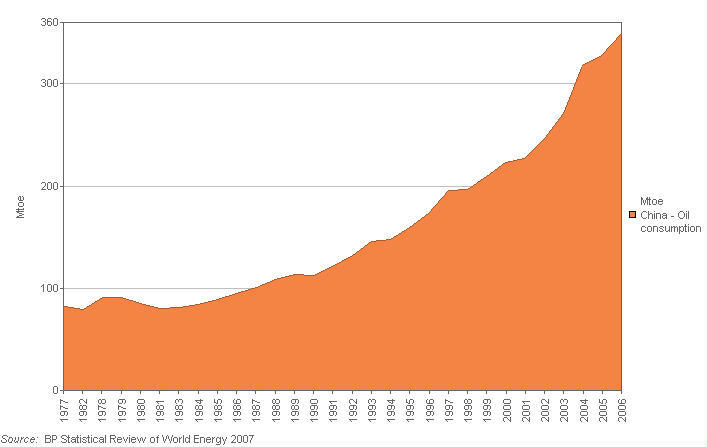 So don’t blame the Chinese for the world’s energy woes. They are doing an effective job of managing energy. A latecomer to the world’s petroleum stage, China is now simultaneously the world’s second-largest oil consumer, the third-largest net importer, and the fifth-largest producer. In the last 15 years the dragon has been sending its agents into the world to secure the new energy supplies it desperately needs. Compared to the West’s international producers, China’s national oil companies arrived late to the petroleum Olympics, and they are not large contenders. The prizes left in play are expensive, and often in countries where Western companies refuse to operate because of human rights issues. Through petroleum-related state-owned enterprises (SOEs) – China National Petroleum Corporation (CNPC), China National Offshore Oil Corporation (CNOOC) and China Petroleum and Chemical Corporation (Sinopec) – China started investing outside the country in 1993, just as the country became a net oil importer. China’s first petroleum acquisition was in Thailand, but CNPC acquired exploration acreage in Canada and Peru the same year. The amount of equity oil generated by those projects was relatively insignificant, and this remained the case for several years. In terms of Canada’s ties with China, 1997 was an important year. As the British were preparing to return Hong Kong to China, Sir Li Ka-shing, the colony’s richest man and chairman of the Hutchison Whampoa conglomerate, became the owner of Husky Energy. Husky’s headquarters continued to be in Calgary, and the acquisition did not affect the company in the short term. However, Husky has since expanded its assets offshore China, and is now the largest foreign owner of exploration blocks there. All its holdings there are in the South China Sea. Since 2001 Husky has signed eleven production sharing contracts in collaboration with the China National Offshore Oil Company (CNOOC) – now publically listed, but 70% owned by the government of China. Husky can participate in these projects up to 51%, and the company describes its entry into China as part of a strategy to develop conventional oil and gas outside North America. Certainly the company is also part of Chinese strategy, also. It is one source of capital for mandarins focused on securing energy supplies by developing the Middle Kingdom’s domestic resources. The Venezuela Card: China cannot secure Canadian oil supplies as long as the only export pipelines from Alberta lead into the United States. Especially after the two countries announced in 2005 an agreement on energy cooperation, it was therefore astonishing when CNPC announced last year that it had pulled out of an agreement to take a 50% stake in the proposed Enbridge-operated Gateway Pipeline. When completed, the pipeline will transport 400,000 barrels of oil per day to Kitimat BC for overseas export. According to the terms of the original deal, CNPC would take 200,000 barrels per day of throughput, with the balance being exported to refiners in California. If the line had been expanded to 800,000 barrels per day capacity, CNPC could have acquired a larger stake. For a country with rapidly rising oil demand, what’s not to like about this deal? When PetroChina vice president Song Yi-wu announced the dragon’s decision, he put it in the political context of a nation re-evaluating its commitment to Canada’s oilsands. Projects take too long to get off the ground here, he said, and the political environment “frustrates” Chinese investors. Song said China would slow down its involvement in the Canadian oilsands business, give up its involvement in the Gateway pipeline project and wait for better investment policies and politically friendly opportunities in the future. Translation: Chinese policy-makers were frustrated over the unwillingness of Canadian producers to partner with CNPC in a production/refining venture that would see Canadian bitumen and heavy oil sent to Asia for processing. Forecasting that CNPC couldn’t begin to produce bitumen from the oilsands for at least another decade, he made it clear that China’s near-term heavy oil strategies were pointed directly at Venezuela, where a “warm-hearted” President Hugo Chavez has taken steps to nationalize oil operations. Song said China is building energy security for its people in “politically friendly” countries, which include Venezuela, Saudi Arabia, Russia and a host of Asian and African nations – Burma, for example, and Sudan. Call it the Venezuela card. The Venezuela card suggests a competitive advantage for China that Western countries often will not play. The dragon sees oil security as an urgent need, and is willing to exert whatever cunning, speed and power it must to meet its future needs. Not surprisingly, given its political structure and domestic situation, China will not let issues like liberal democracy and human rights stand in the way of its quest for energy. Do Western oil companies let political and human rights niceties stand in the way of business? It’s a matter of degree, of course, but it is not difficult to find examples of North American and European companies pulling out because of political risk and public pressure based on human rights abuses. In Canada the most famous case is that of Talisman. Ten years ago the company acquired a 25 percent interest in a developing oil project in Sudan. The production facilities, pipeline and offshore loading terminal were being built and the wells were being drilled. By the summer of 1999, oil was flowing and being exported. By 2002, the project was producing 240,000 barrels of oil a day, with the equity oil being distributed to the project’s participants, three of which were subsidiaries of state-owned oil companies from China, Malaysia, and Sudan. The only privately owned company in this consortium, Talisman bowed to public pressure based on Sudan’s human rights record and sold its 25% interest to an oil company owned by the government of India. The pattern is clear. The Asian players were unconcerned about human rights. There is a subtext here about Asian strategies toward energy. Especially in the face of a high-profile divestment campaign like that launched against Talisman, Western companies will buckle in the face of pressure related to human rights, environmental integrity and so on. Chinese and other Asian companies will not. For example, all three of China’s oil and gas SOEs are active in Burma. Latecomers to the petroleum Olympics, they measure petroleum victory in terms of land, reserves and production. Comparative Advantages: Chinese industry’s willingness to overlook “soft” issues like human rights gives it a distinct comparative advantage. China’s willingness to bring diplomacy to bear on behalf of its SOEs gives it another. These advantages are rebalancing the planet in the direction of China. The dragon is rising. Chinese energy policy is directed by government, and some 70% of the world’s petroleum resources are now controlled by national oil companies like Saudi Aramco and Petróleos de Venezuela. State-to-state negotiations are especially important when one of the participants is an emerging superpower. Much of China's efforts are directed to Central Asia, from which, for example, a trans-Kazakhstan pipeline is already delivering oil from the Caspian Sea. Two other factors in China’s favour deserve mention. One is that Southeast Asia is home to many in the Chinese Diaspora – the descendants of the many waves of migration from China over the last millennium. Particularly as colonialism collapsed after the Second World War, they came to control great assets and even some national economies. By some estimates the third largest economic entity in the world, the Overseas Chinese began repatriating capital to China in the 1990s, thereby igniting the Chinese miracle. Today they occupy key positions in Southeast Asian business and government, and strengthen local ties with China. Another factor working for China began during Cultural Revolution – that decade of social, political, and economic madness from 1966 until the arrest of the Gang of Four. Despite mutual fascination and incomprehension, during those years black African governments and African revolutionary movements were the recipients of Chinese aid (both military and economic) and other diplomatic efforts. African governments – many of them successors to those revolutionary movements – remember China’s efforts during that time. That diplomacy is now paying off with preferential access to petroleum leases and production sharing contracts. A classic example is Angola, in West Africa. Mainly because of the expansion of its oil industry that country has the fastest-growing economy in the world, and its growth is mainly driven by Chinese explorers and producers. China’s SOEs got access to Angola’s offshore as a ‘Thank you’ to the People’s Republic of China. Despite desperate poverty at home during the Cultural Revolution, the dragon still found the wherewithal to support Angola’s independence movements during those critical years. China’s Peaceful Rise: A final point deserves comment. In the late 1990s, China’s central government developed what it called “the new security concept.” The idea is that the Cold War mentality of antagonistic blocks no longer makes sense. In a globalizing world, nations can increase their security through diplomatic and economic interaction. This notion has become part of a foreign policy doctrine known among diplomats as “China’s peaceful rise” – a policy that, for example, encourages Chinese businesses to form partnerships with Western firms. For Canada, which is one of the few countries likely to increase production in the coming decade, it has important implications. Consider, for example, that Enbridge is undeterred by CNPC’s decision to pull out of the Gateway Pipeline. “The appeal (of this pipeline) to Canadian producers is that you would get another bid on the crude oil from somewhere other than the United States,” said Enbridge’s executive vice president, Steve Wuori. Also, of course, pipeline costs would be less. Although China has placed less than 1% of the $50 billion investment in the oilsands since the early 1990s, it is still part of the equation. China’s most significant direct investment has been the SinoCanadian Petroleum joint venture, through which Sinopec owns a 40% stake in Synenco’s Northern Lights project. CNOOC made its presence known with the acquisition of a small interest in MEG Energy, which is focusing on a project at Christina Lake. Obsessed with diversifying its oil sources and avoiding dependence on a single supplier, Beijing sees Canada as a country in the U.S. sphere of influence, a country where oil could be held hostage to political concerns. It has little enthusiasm for multibillion-dollar oil deals in a country whose relations with China have been soured by human-rights disputes. Think Tibet. “China doesn’t want to make a multibillion-dollar commitment to a country where the political contacts are constrained,” says Jiang Wen-ran of the University of Alberta’s China Institute. Professor Jiang adds that the Middle Kingdom worries about Canada’s business practices. Canadians can’t explain how they will triple production from the oilsands given environmental constraints. The costs of environmental protection seem out of control. Labour costs are reaching the moon. The Panda Speaks: This article has focused on the areas of Chinese petroleum development where Westerners are more likely to see a dragon than a panda. Of course, in modern China it is the giant panda that speaks for the neo-imperial court. To conclude, let’s listen to what this species has to say.